This afternoon I will be finishing up over 100 felt wool beads. Some are for a consignment order and some are for my online shops. Honestly, I didn't use to enjoy making wool beads, but I've found my own way of doing things and am much more comfortable with the process. It is very enjoyable now, but when I have to make so many, it is a little monotonous at times. The end result *always* makes it worth the effort though. 1. I use nicely dyed raw wool fleece (short haired fibers). 2. I needle felt the fleece into a rough round shape (about 3 - 5 minutes). This makes each bead easier to wet felt later and the process goes faster, at least it does for me. 3. After the bead is wet felted with hot soapy water (about 5 - 7 minutes), this is the final result. Sometimes I soak my beads in a weak acid-free glue solution to get rid of the fuzzies and make them more sturdy and durable. The entire process takes about 10 minutes per bead, excluding set up time, etc. I sell top quality, neatly packaged needle felted and wet felted beads in my etsy shop and soon in my ecrater shop. I do highly recommend that people try it for themselves though. It is a fun project, especially with the kids. 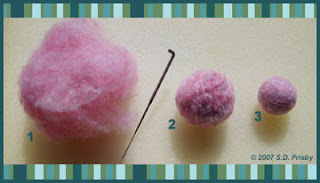 You can create beads through needle felting, wet felting, or a combination of both, like I have done here. They are great to make all kinds of crafty items (see my shop for examples). Love the beads, they look great. I've never tried my hand at felting, but it has always seemed like fun. Especially wet felting bags and hats.